As both the public and private sector are challenged to keep up to date with the needs and wants of their user groups, there is an increased need for organisations to examine their methods for creating and delivering new products. The library service has taken this challenge head on and hosted the Future Libraries Product Forge Hackathon to re-imagine its role and functions: working in different ways in order to be sustainable and relevant. 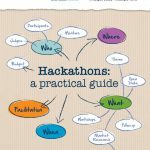 This report summarises the learnings of the Future Libraries Product Forge, examines the value of hackathons for wider public services and examines the delivery model of a hackathon as a viable approach for producing new services.